Deglaciation of the Pacific coastal corridor directly preceded the human colonization of the Americas. 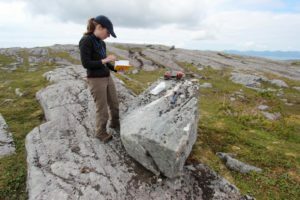 AMERICAN ASSOCIATION FOR THE ADVANCEMENT OF SCIENCE—New dating of rocks and reanalysis of animal bones from islands along the shore of southeastern Alaska suggests that a narrow corridor between the Pacific Ocean and the Cordilleran Ice Sheet (CIS) in Alaska may have enabled the migration of humans to the Americas as early as 17,000 years ago. While the data imply that this Pacific coastal corridor – a pathway exposed following deglaciation – was physically and environmentally viable for early human migration to the Americas, the authors say that archeological evidence of human activity is still necessary to confirm that this pathway played an important role in the peopling of the Americas. The Beringia route was widely believed by many in the 20th century to be the course of human migration to the Americas from Asia. Recent analyses, on the other hand, have suggested that early human migration took place approximately 16 thousand years (ka) ago through a deglaciated corridor to the west of the CIS along the North Pacific coast. Yet, whether or not the coastal region’s environmental conditions – such as biological productivity, availability of food resources and the presence or absence of physical barriers – were fit to support humans at that time remains unknown. Here, Alia J. Lesnek and colleagues reconstructed deglaciation using two different proxies. First, they applied 10Beryllium-dating of ten rock surfaces – five perched boulders and five bedrock samples – from three proposed areas: Dall Island, Suemez Island, and Warren Island. Second, they utilized previously published 14Carbon-dated mammal and bird bones found in caves on nearby islands. Their analysis showed that this area was glaciated from around 20 to 17 ka ago and thus not open for human migration. However, the islands were deglaciated after 17 ka ago and hosted robust terrestrial and marine ecosystems that could support humans during southward migration into the Americas.